Dubai, UAE, October 31, 2018: Participation in yummex Middle East proved particularly sweet for four exhibitors from Brazil, Bulgaria, India and Pakistan who now get to showcase their groundbreaking products in full view of the regional industry’s leading players, decision makers and buyers at the exclusive yummex Middle East Gallery for the remainder of the show. With award entries from South America to South Asia and beyond, the winning quartet beat off strong international competition to secure awards for the most innovative products at the region’s leading sweets and snacks event across four categories: ‘Best Chocolate Product’; ‘Best Hard & Soft Candy’; ‘Best Bakery Product’ and ‘Best Snack Product’. The winners were decided by a jury consisting of independent global industry experts and awarded during a gala gathering held at Dubai World Trade Center last night. 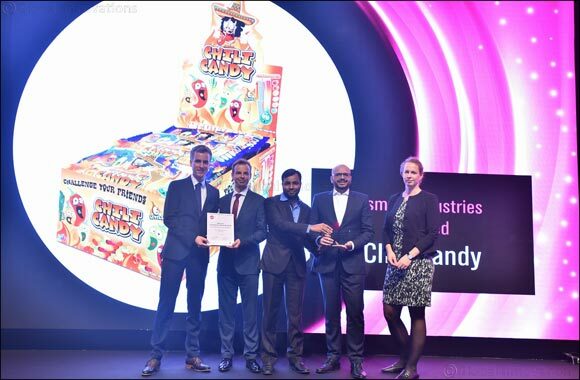 In addition to ensuring their showstopping products will catch the eye of all visitors to yummex Middle East this week, the awards give the industry innovators a passage to global exposure with the opportunity to display their breakthrough snacks at ISM Cologne 2019, the largest trade fair for the confectionary sector, which will be held in January in Cologne, Germany. The accolade for ‘Best Chocolate Product’ went to Brazil’s Divine Chocolates’ FOR FIT healthy chocolate bar, which edged out competitors thanks to its high cocoa, whey protein and soy-based isolated protein percentages, its lack of added fat and sugar and its gluten-free characteristics. The award for ‘Best Hard & Soft Candy’ went to Pakistan’s Ismail Industries Limited for its new range of fruit-flavoured chili jelly beans, which is an entirely new concept that combines the different flavours of fruits with varying degrees of spice. Meanwhile, the ‘Best Bakery Product’ title was secured by India’s Lovely Bake Studio for its vegetarian-friendly almond roasted cookies, which is produced without eggs, and includes sliced, honey-coated almonds. The cookies meet all the country’s religious and health concerns and are produced in line with the company’s aim to have the “best tasting cookies in the world,” according to Studio’s Shaishav Mittal. Apart from the age-old recipe of the cookies, Mittal says attention to packaging detail gives the product an extra advantage. “Our individually pillow-packed cookies and international tin packaging have a longer shelf life, give a unique look and feel and are made to be shared with friends and guests,” he explained. Rounding out the awards roll-call was Bulgaria’s Prestige 96AD, which walked away with the ‘Best Snack Product’ accolade for its Prestige Wellness Probiotic Sandwich biscuits, which are produced with the help of the Bulgarian Diabetes Association and are made with the natural sweetener, maltitol, with no added sugar. The winning biscuit range, says Temelkov, incorporates two valuable innovations. The first is its signature perfect probiotic cream with the ‘Bacillus coagulans’ probiotic. “This maintains a minimum number of 115 million live cultures in each sandwich biscuit. Probiotics are called ‘good’ bacteria that help us to keep our gut healthy and provide a lot of powerful benefits for our body,” said Temelkov. Secondly, Prestige maintained sweetness without adding sugar by using the natural sweetener maltitol. “This is a natural product extracted from grain and which contains fewer calories than sugar,” Temelkov explained. “We believe our product is an excellent choice for people with an active lifestyle with daily on-the-go consumption and for those who regularly monitor their blood sugar levels. It is perfect for those who are conscious of their nutrition but at the same time are not willing to compromise the good taste of the product,” he added. The winning products from the yummex Middle East Innovation Awards are being showcased in the yummex ME Innovation Gallery, located at hall number 2 in Dubai World Trade Center.